Nothing can be more devastating for parents than to discover that their child has cancer (or any other similar crushing disease). Just the mention of the word “cancer” generates fears of suffering and eventual death in their young one. Fortunately there IS hope for the future of little ones affected by cancer! Danny Thomas, son of Lebanese immigrants, successful comedian and actor of the era, had a dream to help children with cancer. Being a strongly religious man he made a “pledge” to St Jude Thaddeus, patron saint of hopeless causes, which he made in the depths of his professional struggles. 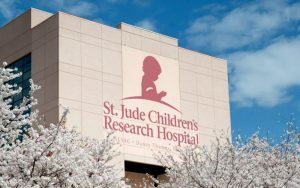 He vowed, ‘Show me my way in life and I will build you a shrine.’ The “shrine” evolved into St. Jude’s Children’s Research Hospital, located in Memphis, Tennessee, and is now the most technologically advanced children’s hospital in the United States, if not the world. “St. Jude Children’s Research Hospital opened its doors on February 4, 1962, based on Danny’s dream that “no child should die in the dawn of life.” Since then, we’ve made incredible strides in childhood cancer research. We’ve helped improve the survival rate of childhood cancer from 20% to 80%. And Acute Lymphocytic Leukemia (ALL) , the disease with a virtual death sentence in 1962, now has a survival rate of 94 percent. For information on how to contribute to the work of St. Jude’s Children’s Research Hospital, PLEASE VISIT THEIR SITE.